From the better-late-than-never department: It took me parts of four different days to finally put this together, but here's TWiME for the seven days beginning June 17. June 17: NCTM President Matt Larson blogged about his vision for NCTM. As I've said before, I'm pleasantly surprised at how NCTM has moved in the past couple of years to be more open, responsive, and innovative. Matt Larson's vision echoes some thoughts of my own, but as I went to the comment section, my critique now turns to the online math ed community: Three comments? That's it? Two of the comments I'm pretty sure belong to past NCTM presidents Michael Shaughnessy and Johnny Lott, which leaves only one from a teacher. I'm writing this more than 10 days after Larson published the post, and while there was enough Twitter activity to make this the most-shared thing on the 17th, the lack of comments troubles me. And since I'm amongst the non-commenters, I'm as guilty as the rest. I may have to change that. Will you? June 18: Mike Lawler showed us "A fun way to estimate e with kids." I don't find much of anything with e and natural logs to feel natural at all, so I watched all three videos with interest. June 19: A nice thing about writing versus talking is that when I want to salute the U.K. for something good, I can just use a word or phrase without attempting the accent. Here's Hannah Fry with a cracking interview in The Guardian, "There's a mathematical angle to almost anything." 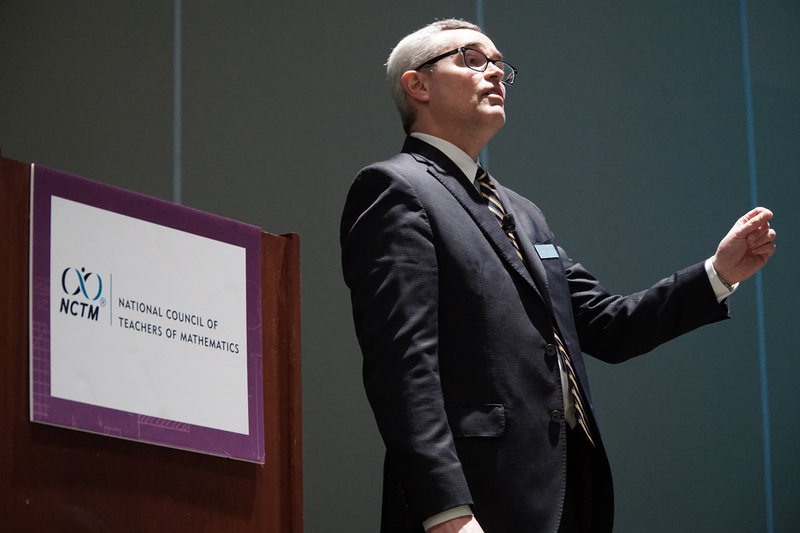 June 20: In the latest installment of the story that just won't quit, Rebecca Mead in The New Yorker writes, "Andrew Hacker, an outspoken critic of mandatory algebra education, is asked to defend his contentions at the National Museum of Mathematics." June 21: A Katrina Schwartz article from last August made the rounds again, featuring comments from David Wees in "Seeing Struggling Math Learners as 'Sense Makers,' Not 'Mistake Makers'." June 22: With clever (and bad) drawings, Ben Orlin illustrates Sfard's process/object divide with "What Students See When They Look at Algebra." June 23: An interesting outcome of the Fordham survey described in Education Week is that, on average, teachers seem to say some things that might seem contradictory. Here, they say there is a higher priority on computation, yet memorization is down. Similarly, when Choppin, Davis, Drake, and McDuffie (2013) surveyed middle school math teachers about Common Core, in which some teachers said Common Core requires them to teach more conceptually and more procedurally. Results like these are a good reminder that survey responses sometimes have to be taken with a grain of salt. You can check out the recording of Sara Van Der Werf's Global Math Department presentation, "The Pursuit of 100% Engagement: Practical ideas to get you closer." It doesn't appear there was a new presentation tonight, and I don't see one for next week, yet, but you can check the GMD website to see when the next one is announced. Otherwise, the math ed web seems pretty quiet. I think either teachers are taking a well-earned break, or they're too busy at conferences or in PD to be doing as much online. The July 2016 issue of ZDM is themed, "improving teaching, developing teachers and teacher developers, and linking theory and practice through lesson study in mathematics: an international perspective." NEW: Roaring Fork Schools (Re-1) is seeking a dynamic and engaging, full-time alternative math teacher for Bridges High in Carbondale. This is an immediate hire to start in August for SY 2016-17. Roaring Fork Schools is 2.5 hours from Denver, has a world-class hot springs, and recently passed a $122 million bond issue. Apply here and contact Nate Adams if you have questions. Arapahoe High School in Littleton needs a long-term math substitute.